Most entries on the invention of helicopter mention a mysterious "1463 European painting" containing a depiction of a flying top. I have no clue what this painting might be, but I do know a remarkable painting ("The Virgin and Child in a Landscape", NG713) showing baby Jesus playing with a cord-spun propeller top dating from the early 16th century. It has been attributed to Jan Provoost (1491-1529). The toy is presumably Chinese in origin (variously attributed to a 320 AD or a 1100 AD invention and claimed to be brought to Europe by Marco Polo). The striking thing about it (that never appeared to me before) is that the propeller is a cross; apparently the toy had devotional value that made it popular at the end of the 15th century. ...The object held by the Child is a toy that could be made to rise and fall. Its shape recalls the Cross on which the adult Christ will be crucified. ...Since 400BC the Chinese had a bamboo flying top that was used as a children's toy. This toy eventually made its way to Europe and is depicted in a 1463 European painting. Pao Phu Tau (???) was a 4th century book in China that described some of the ideas in a rotary wing aircraft. ...In 1100 AD the Chinese invented a helicopterlike flying top. 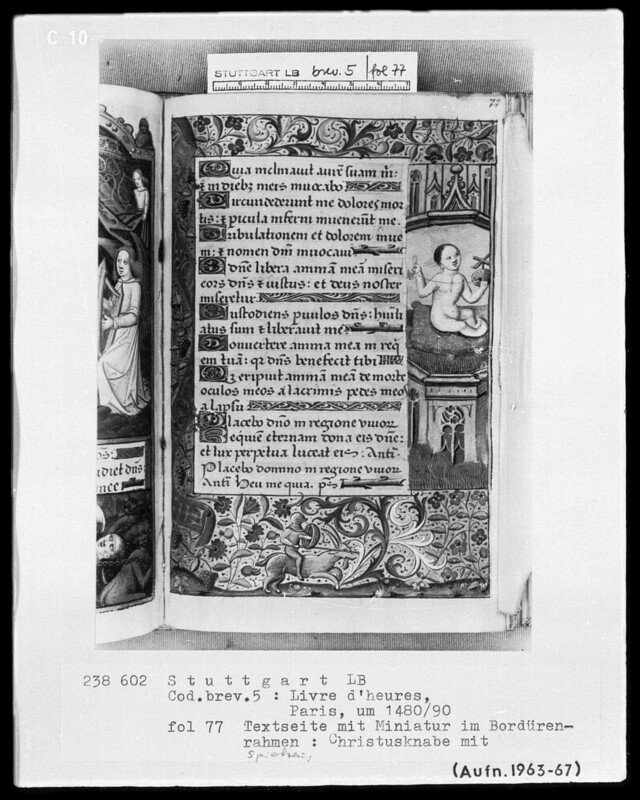 Paris, Lateinisches Stundenbuch (Livre d'heures), um 1500, Handschrift, Stuttgart, Württembergische Landesbibliothek, Cod. brev. 5. Buchausstattung. Christusknabe mit dem Windrad, Miniatur (in der Bordüre). Thanks a lot! Surely that's our toy -- in the same hands. I despaired to locate the proverbial 1463 painting; it might be lore. Я тоже не думаю, что это мельницы: игрушечные мельницы восемнадцатого века выглядели так как их бы нарисовал человек несведующий и сегодня: домик с лопастями. Вот здесь, кстати, утверждается, что горизонтальные пропеллеры с двумя лопастями встречались в Новгороде двенадцатого века. Amazing -- but these do not seem to be flying tops. The mill (both the contraption and the board game) came to Novgorod from the Hansa; spinning propellers are Asian. The text says that these "propellers" were used by Norse kids for jousting (!) rather than flying. How did they joust with them is left to our imaginations. A toy typically passes through a stage when it has some military or other use so it grows more sophisticated through such use. Say, a kite was used for fishing, and the first detailed written account of the flying kite is from 200 BC, by General Han Hsin (for trench measurement during a siege). Stabilization of projectiles would be an obvious practical thing to do with a propeller, although I do not know any examples of such a use before modern times. I wonder if that was the use of the propellers for "jousting" in Novgorod. Я попробую спросить, может быть кто-нибудь из специалистов по Новгороду отзовется. Asking the adults wouldn't get us anywhere. I'll try it on a bunch of kids.